Here is some information that will help you arrive and enjoy your stay. Check availability calendars for the House or Cabin and contact us for a reservation. See posts, guest reviews, and pictures on our Facebook page. Download PDF of directions. See area maps on The Surroundings page. Get to Rt. 3 south in Ellsworth, Maine. Take Rt. 3 south to Trenton, then cross the bridge to Mount Desert Island. (A) At the first intersection, bear right onto Rts. 102 and 198. Travel 4.3 miles to an intersection with a gas station and small grocery in Somesville. Make note of that convenience store, the closest gas and grocery to Acadia Getaway. (B) Turn left and follow Rt. 198/Sound Drive for 1.4 mile. (C) Turn left onto Rt. 233/Eagle Lake Road. Follow for 2.2 miles. When you see the horses at Autumn Farm on the left, slow down. Acadia Getaway is on the right, gray house, #744. When arriving after dark, look for blue reflectors. If staying in the House, please do not block the driveway that goes to the Cabin, which is in the rear of the lot. To orient you, if you continued on Eagle Lake Road for another 3½ miles, you would be in downtown Bar Harbor. 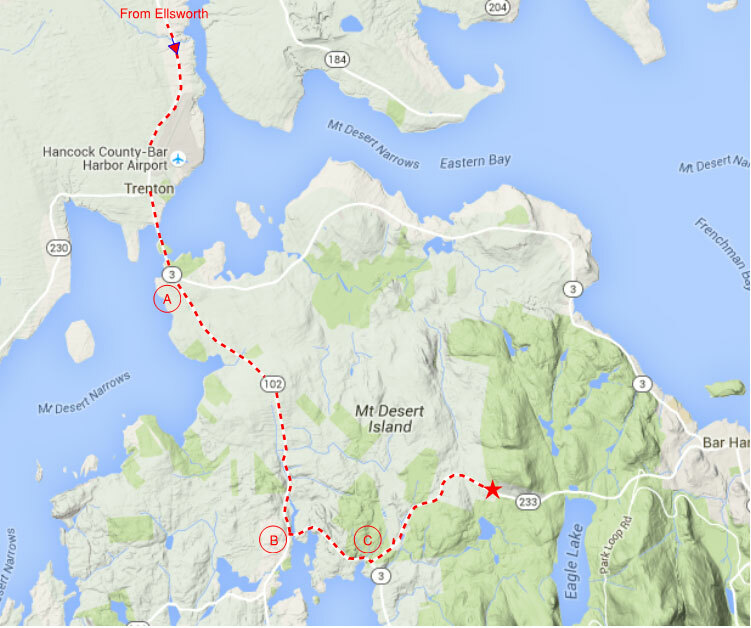 You can reach Bar Harbor Car-Free, then take the Island Explorer Shuttle (Routes 6&7) to Acadia Getaway. Ask us for details.